Reincarnation (from Latin meaning "to be made flesh again") in religion and philosophy refers to the belief that a part of a living being survives death to be reborn in a new body. This reincarnated self carries with it some essence or identity of the past life into the next life, although it is usually not aware of it. Reincarnation is a central tenet of Hinduism, Buddhism, Jainism, and many theosophical and New Age groups. The monotheistic religions of Judaism, Christianity, and Islam generally do not accept reincarnation. They teach that each human being is given only one earthly life. However, a Hassidic Jewish doctrine called gilgul resembles reincarnation. The Christian thinker Geddes MacGregor adopted reincarnation in order to do justice to the love of God, who would give a second chance for the deceased wicked to be saved. Among contemporary spiritualists, opinions on reincarnation are divided, with some accepting it as real and others regarding it as a harmful belief leading to cases of spirit possession. The strongest evidence for reincarnation comes from those who allegedly remember details of their past lives. Some hypnotherapists have utilized techniques to call forth early childhood memories in order to plumb memories of past lives, and find recalling such memories helpful in therapy. Researchers such as Ian Stevenson have explored the issue of reincarnation in a scientific way and published suggestive evidence. Skeptics remain critical of his work and reincarnation in general. For those who reject reincarnation on theological grounds, an alternative way of explaining alleged memories of past lives is to attribute them to the influence of spirits. Sensitive earthly people can receive detailed knowledge about those spirits' earthly lives and, if they believe in reincarnation, construe it as memories of their own past lives. Such relationships, according to Christian theologian John Hick, may provide the spirits with opportunities for spiritual growth beyond the grave. The process, though understood within the Christian framework bodily resurrection, provides a second chance for these spirits to grow and surmount challenges that the failed to master during their earthly lives. It thus provides the same benefit as reincarnation, although it is a purely spiritual process. 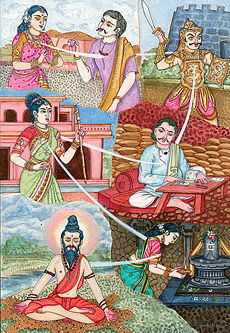 In India the concept of reincarnation is first recorded in the Upanishads (c. 800 B.C.E. ), which are philosophical and religious texts composed in Sanskrit. The idea was also entertained by some Ancient Greek philosophers. Among the ancient Greeks, Socrates, Pythagoras, and Plato may be numbered among those who made reincarnation an integral part of their teachings. At the end of his life, Socrates said, "I am confident that there truly is such a thing as living again, and that the living spring from the dead." Pythagoras claimed he could remember his past lives, and Plato presented detailed accounts of reincarnation in his major works. Many Gnostic groups such as the Sethians and followers of Valentinus apparently believed in reincarnation. For them, reincarnation was a negative concept: Gnostics believed that the material body was evil, and that they would be better off if they could eventually avoid having their 'good' souls reincarnated in 'evil' bodies. In the Hermetica, a Graeco-Egyptian series of writings on cosmology and spirituality attributed to Hermes Trismegistus/Thoth, the doctrine of reincarnation is also central. Belief in reincarnation was probably commonplace among the Vikings. The annotator of the Poetic Edda wrote that people formerly used to believe in it, but that it was in his (Christian) time considered "old wife's folly." Reincarnation also appears in Norse mythology in the Poetic Edda. The editor of the Poetic Edda says that Helgi Hjörvarðsson and his mistress, the Valkyrie Sváfa, whose love story is told in the Helgakviða Hjörvarðssonar, were reborn as Helgi Hundingsbane and the Valkyrie Sigrún. Eastern beliefs regarding reincarnation are common and tied to presuppositions concerning the existence or non-existence of an enduring 'self.' There are important philosophical differences regarding the nature of the soul (also known as the jiva or atman) amongst the various schools of Hinduism and Buddhism. Some schools deny the existence of a 'self', while others claim the existence of an eternal, personal self, and still others say there is neither self or no-self, as both are false. Each of these beliefs has a direct bearing on the possible nature of reincarnation. According to Hinduism, the self (atman) is immortal, while the body is subject to birth and death. The Bhagavad Gita states that: "Worn-out garments are shed by the body; Worn-out bodies are shed by the dweller within the body. New bodies are donned by the dweller, like garments." The idea that the soul (of any living being including animals, humans and plants) reincarnates is intricately linked to karma, another concept first introduced in the Upanishads. Karma (literally: action) is the sum of one's actions, and the force that determines one's next reincarnation. The cycle of death and rebirth, governed by karma, is referred to as samsara. Because of the quality of his acts and of himself. Hinduism teaches that the soul goes on repeatedly being born and dying. One is reborn on account of desire: a person desires to be born because he or she wants to enjoy worldly pleasures, which can be enjoyed only through a body. Hinduism does not teach that all worldly pleasures are sinful, but it teaches that they can never bring deep, lasting happiness or peace (ānanda). According to the Hindu sage Adi Shankaracharya, the world as we ordinarily understand it is like a dream: fleeting and illusory. To be trapped in samsara is a result of ignorance of the true nature of being. After many births, every person eventually becomes dissatisfied with the limited happiness that worldly pleasures can bring. At this point, a person begins to seek higher forms of happiness, which can be attained only through spiritual experience. When, after much spiritual practice (sādhanā), a person finally realizes his or her own divine nature, i.e., realizes that the true "self" is the immortal soul rather than the body or the ego, all desires for the pleasures of the world will vanish since they will seem insipid compared to spiritual ānanda. When all desire has vanished, the person will not be reborn anymore. When the cycle of rebirth thus comes to an end, a person is said to have attained moksha, or salvation. While all schools of thought agree that moksha implies the cessation of worldly desires and freedom from the cycle of birth and death, the exact definition of salvation depends on individual beliefs. For example, followers of the Advaita Vedanta school (often associated with jnana yoga) believe that they will spend eternity absorbed in the perfect peace and happiness that comes with the realization that all existence is One (Brahman), and that the immortal soul is part of that existence. The followers of full or partial Dvaita schools ("dualistic" schools, such as bhakti yoga), on the other hand, perform their worship with the goal of spending eternity in a loka, (spiritual world or heaven), in the blessed company of the Supreme Being (i.e., Krishna or Vishnu for the Vaishnavas, Shiva for the Shaivites). Jainism, like Hinduism, emphasizes the deposit of karma from past lives as determinative of one's current destiny. Inherited karma and the karma acquired in one's own life determine the site of reincarnation. Jainism teaches rigorous asceticism to liberate oneself from the fetters of karma; and in particular by avoiding violence to all living beings. The Jain's ultimate goal is to realize perfection and the state of paramatman, free from all karmic fetters and beyond the reach of rebirth. In Sikhism reincarnation is a central tenet. The Sikhs believe that the Soul has to transmigrate from one body to another as part of an evolution process of the Soul. This evolution of the Soul will eventually results in a union with God upon the proper purification of the spirit. If one does not perform righteous deeds, ones soul will continue to cycle in reincarnation forever. A being who has performed good deeds and actions in their lives is transmigrated to a better and higher life form in the next life until the soul of the being becomes Godlike. The Buddha taught a concept of rebirth that was distinct from reincarnation. The Buddhist concept of rebirth, although often referred to as reincarnation, differs significantly from the Hindu-based traditions and New Age movements in that there is no "self" (or eternal soul) to reincarnate. This concept was consistent with the common notion of a sequence of related lives stretching over a very long time, but was constrained by two core Buddhist concepts: anattā, that there is no irreducible ātman or "self" tying these lives together; and anicca, that all compounded things are subject to dissolution, including all the components of the human person and personality. At the death of one personality, a new one comes into being, much as the flame of a dying candle can serve to light the flame of another. Since according to Buddhism there is no permanent and unchanging self (identify) there can be no transmigration in the strict sense. However, the Buddha himself referred to his past-lives. Buddhism teaches that what is reborn is not the person, but that one moment gives rise to another, and that that momentum continues, even after death. It is a more subtle concept than the usual notion of reincarnation, reflecting the Buddhist concept of personality existing (even within one's lifetime) without a "soul." Buddhism nevertheless affirms samsara, the continual process of death and rebirth. But there is nothing good about it. The first of the Four Noble Truths is that everything from birth to death is suffering. Reincarnation is the mechanism by which suffering continues life after life. The factors such as craving and egoism that condition a life and propel it into the next life are fetters that must be overcome. The Buddhist's goal is to attain Nirvana and end the cycle of reincarnation forever. Reincarnation may sometimes provide a ladder to Nirvana for aspirants who devote themselves to the Buddha's teaching but who are not advanced enough to attain Nirvana in one lifetime. Tibetan Buddhists thus believe that a new-born child may be the rebirth of some important departed lama. However, for the great majority of people reincarnation brings an evil destiny, due to accumulation of bad karma. Many end up spending their next life in one of the Buddhist hells before rising to enjoy another existence, and even then it is said to be very rare for a person to be reborn in the immediate next life as a human. Birth is not a beginning; death is not an end. There is existence without limitation; there is continuity without a starting-point. Existence without limitation is Space. Continuity without a starting-point is Time. There is birth, there is death, there is issuing forth, there is entering in. That through which one passes in and out without seeing its form, that is the Portal of God. This passage is usually interpreted to signify the state of immortality achieved by the sage, transcending life and death, rather than reincarnation as the condition of the unenlightened. The idea that the soul is eternal has been a part of Judaism since the second century B.C.E. The earliest expression of this idea was the doctrine of resurrection of the dead. Josephus, the Roman-Jewish historian, writes about the Pharisees, "they say that all souls are incorruptible, but that the souls of good men only are removed into other bodies, — but that the souls of bad men are subject to eternal punishment." This was not reincarnation over many lifetimes, but just once, into a new incorruptible body. A concept of reincarnation, called gilgul, became popular in Medieval folk Judaism, and is found in much Yiddish literature among Ashkenazi Jews. Among some Kabbalists, it was posited that some human souls could end up being reincarnated into non-human bodies. These ideas were found in a number of Kabbalistic works from the 1200s, and also among Hassidic Jews in the late 1500s. Martin Buber's collection of stories of the Baal Shem Tov's life includes several that refer to people reincarnating in successive lives. Among well known (generally non-Kabbalist or anti-Kabbalist) Rabbis who rejected the idea of reincarnation are the Saadia Gaon, Hasdai Crescas, Yedayah Bedershi, Joseph Albo, Abraham ibn Daud, the Rosh and Leon de Modena. The Saadia Gaon in his Emunoth ve-Deoth concludes Section vi with a refutation of the doctrine of metempsychosis (reincarnation), stating that Jews who hold to reincarnation have adopted non-Jewish beliefs. While most Jews today do not believe in reincarnation, the belief is common in Orthodox Judaism. Most Orthodox siddurim (prayerbooks) have a prayer asking for forgiveness for one's sins that one may have committed in this gilgul or a previous one. The overwhelming majority of mainstream Christian denominations reject the notion of reincarnation and consider the theory to challenge basic tenets of their beliefs. A number of Evangelical and Fundamentalist Christian groups have denounced any belief in reincarnation as heretical, and explained any phenomena suggestive of it as deceptions of the devil. Many churches do not directly address the issue, but indirectly through teachings about death and resurrection. The Bible never mentions the word reincarnation, although it contains passages in the New Testament that could be interpreted to allude to reincarnation. In Matthew 11:10-14 and 17:10-13, Jesus says that John the Baptist is the prophet Elijah who had lived centuries before, and he does not appear to be speaking metaphorically. However, it should be noted that Elijah never actually died, but was raptured in a chariot of fire. Furthermore, the prophetic texts stated that God would send Elijah back to Earth, as a harbinger of Jesus Christ. Conversely, there are several passages in the New Testament (such as Hebrews 9:27 and Luke 16:20-31) that Orthodox Christians interpret as openly rejecting reincarnation or the possibility of any return or contact with this world for the souls in heaven or hell. New Age Christians contend that reincarnation was taught by the early Christian church, but that due to bias and mistranslations, this teaching was lost or obscured. Most of the philosophies associated with the theory of reincarnation focus on "working" or "learning" through various lifetimes to achieve some sort of higher understanding or state of "goodness" before salvation is granted or acquired. Several Christian denominations which support reincarnation include the Christian Community, the Liberal Catholic Church, Unity Church, the Christian Spiritualist Movement, the Rosicrucian Fellowship and Lectorium Rosicrucianum. The Medieval sect known variously as the Cathars or Albigensians which flourished in the Languedoc also believed in reincarnation, seeing each soul as a fallen angel born again and again into the world of matter created by Lucibel (Lucifer). Only through a Gnostic 'Rebirth' in the Holy Spirit through Christ could the soul escape this process of successive existences and return to God. Some contemporary Christian thinkers have attempted to entwine Christianity and reincarnation. Geddes MacGregor, an Anglican priest and theologian, argued that when Christianity without a doctrine of reincarnation teaches that we are given only one earthly life which determines, once for all, whether we go to heaven or hell, it is contradictory to a God of love. Modern Sufis who embrace the idea of reincarnation include M.R. Bawa Muhaiyadeen and Hazrat Inayat Khan. Reincarnation has also been used to reconcile the [[Qur'an]['s apparent identification of Miriam, the mother of Isa, as the sister of Aaron and daughter of Amran, all of whom lived well before the first century C.E. Thou [God] makest the night to pass into the day and Thou makest the day to pass into the night, and Thou bringest forth the living from the dead and Thou bringest forth the dead from the living, and Thou givest sustenance to whom Thou pleasest without measure (Qur'an 3:27). "From the (earth) did We Create you, and into it Shall We return you, And from it shall We Bring you out once again" (20:55). "And Allah has produced you from the earth, Growing (gradually), And in the End He will return you Into the (earth), And raise you forth (Again at the Resurrection)" (71:17-18). "Nor will they there Taste Death, except the first Death; and He will preserve Them from the Penalty Of the Blazing Fire" (44:56). "Is it (the case) that We shall not die, except our first death, And that we Shall not be punished?' Verily this is The supreme achievement! For the like of this Let all strive, Who wish to strive" (37:58-61). During the Renaissance, a new flowering of public interest in reincarnation occurred. One of the prominent figures in the revival was the Italian philosopher and poet Giordano Bruno, who was ultimately burned at the stake by the Inquisition. During the classical period of German literature, metempsychosis ("transmigration of the soul") attracted much attention: Goethe played with the idea, and it was taken up more seriously by Lessing and by Herder. It was mentioned with respect by Hume and by Schopenhauer. Irish poet and Nobel Laureate William Butler Yeats proposed a novel theory of reincarnation in his occult treatise A Vision. According to his view, reincarnation does not occur within a framework of linear time. Rather, all of a person's past and future lives are happening at once, in an eternal now moment, and the decisions made in any of these lifetimes influence all of the other lives (and are influenced by them). Reincarnation plays an important role in the ideas of Anthroposophy, a spiritual movement founded by Rudolf Steiner. Steiner described the human soul as gaining new experiences in every epoch and in a variety of races or nations. The unique personality, with its weaknesses and abilities, is not simply a reflection of the body's genetic heritage. Although Steiner described the incarnating soul as searching for and even preparing a familial lineage supportive of its future life, a person's character is also determined by his or her past lives. Anthroposophy has developed various spiritual exercises that are intended to develop the capacity to discern past lives and the deeper nature of the human being. In addition, Steiner investigated the karmic relationships of many historical individuals, from Karl Marx to Julian the Apostate. Modern theosophy, which draws its inspiration from India, has taken reincarnation as a cardinal tenet; it is, according to a recent theosophical writer, "the master-key to modern problems," including heredity. The common definition of reincarnation has been altered from its original meaning. The word has come to mean 'to be born again in different life forms' whereas its actual definition is 'to be born again into the flesh of another body.' Scientology ascribes to this latter, original definition of reincarnation. The first writings in Scientology regarding past lives date from around 1951 and slightly earlier. In 1960, Hubbard published a book on past lives entitled Have You Lived Before This Life? In 1968 he wrote Mission Into Time, a report on a five-week sailing expedition to Sardinia, Sicily and Carthage to see if specific evidence could be found to substantiate his recall of incidents in his own past, centuries ago. American [[mysticism}mystic]] Edgar Cayce promoted the theory of both reincarnation and karma, wherein they act as instruments of a loving God as well as natural laws—the purpose being to teach us certain spiritual lessons. Animals are said to have undifferentiated, "group" souls rather than individuality and consciousness. Once the soul evolves through a succession of animal incarnations and achieves human status, it is not then reborn in animal form. Cayce's view arguably incorporates theosophical teachings on spiritual evolution. I adopted the theory of Reincarnation when I was twenty-six. Religion offered nothing to the point. Even work could not give me complete satisfaction. Work is futile if we cannot utilise the experience we collect in one life in the next. When I discovered Reincarnation it was as if I had found a universal plan I realised that there was a chance to work out my ideas. Time was no longer limited. I was no longer a slave to the hands of the clock. Genius is experience. Some seem to think that it is a gift or talent, but it is the fruit of long experience in many lives. Some are older souls than others, and so they know more. The discovery of Reincarnation put my mind at ease. If you preserve a record of this conversation, write it so that it puts men’s minds at ease. I would like to communicate to others the calmness that the long view of life gives to us. There are people who say they remember their past lives and use that knowledge to help them with their current lives; the belief in this kind of occurrence is central to the New Age movement. Some of the people who remember say they simply remember without any effort on their part. They simply "see" previous times and see themselves interacting with others, occasionally even different creatures besides people themselves. The most detailed collections of personal reports in favor of reincarnation have been published by Professor Ian Stevenson, from the University of Virginia, in books such as Twenty Cases Suggestive of Reincarnation. Stevenson spent over 40 years devoted to the study of children who have apparently spoken about a past life. In each case, he methodically documented the child's statements. Then he identified the deceased with whom the child allegedly identified, and verified the facts of the deceased person's life that matched the child's memory. He also matched birthmarks and birth defects to wounds and scars on the deceased, verified by medical records such as autopsy photographs. In a fairly typical case, a boy in Beirut spoke of being a 25-year-old mechanic, thrown to his death from a speeding car on a beach road. According to multiple witnesses, the boy provided the name of the driver, the exact location of the crash, the names of the mechanic's sisters and parents and cousins, and the people he went hunting with—all of which turned out to match the life of a man who had died several years before the boy was born, and who had no apparent connection to the boy's family. Stevenson believed that his strict methods ruled out all possible "normal" explanations for the child's memories. However, it should be noted that a significant majority of Professor Stevenson's reported cases of reincarnation originate in Eastern societies, where dominant religions often permit the concept of reincarnation. Following this type of criticism, Stevenson published a book entitled European Cases of the Reincarnation Type (2003). However, an unexpected result that casts doubt on reincarnation as an explanation for Stevenson's findings was that in the great majority of cases, the children's recollections involved people who had met some sort of violent or untimely death. This may point to spiritual influence or possession as a better explanation for the children's alleged memories. There is no reason why people who met violent deaths should be reincarnated more frequently than others, but they are more likely to be earthbound and hence to seek out a vulnerable person to influence or possess. There are many people who have investigated reincarnation and come to the conclusion that it is a legitimate phenomenon, such as Peter Ramster, Brian Weiss, Walter Semkiw, but among them only Professor Stevenson has published in peer-reviewed journals. It offers one of the classic explanations for why some people suffer misfortune while others enjoy a lucky life: the misfortune can be explained as the result of my own misdeeds in a previous life. It maintains the justice of the cosmos by insisting that each person is responsible for their own future. It provides a reason to endure suffering and pain, for the sake of expiating sins of past lives. This is a good doctrine for the religious life. It dampens pride. Whatever our good qualities, in past lives we no doubt committed many sins. Although in this life we might enjoy privilege and high status, in past lives we were no doubt living in poverty and wretchedness. In the modern New Age dress, reincarnation is good news, since it gives everyone a second chance. This helps explain its popularity. It creates human solidarity, since anyone we encounter could be a brother, a granddaughter, a mother or a son. In a previous life I might have been my neighbor's father; therefore that neighbor is my son. My worst enemy may be my son or grandson. Therefore, to wrong any human being may be harming my own kin. It creates solidarity with all creatures, because they also may be reincarnated humans, and I might have been one of them in a past life. Reincarnation links all life together in a seamless web; that steak you just ate might have come from a cow that was one of your offspring from a previous life when you were a cow. Reincarnation is compatible with Eastern cultures which are attuned to the cyclic rhythms of nature. The rebirth of souls into new bodies is as natural as the new growth of plants every spring. For Christians like Geddes MacGregor, giving people a second chance is confirms the love of God. It is therefore superior to traditional teaching that sinners are judged to eternal punishment in hell. The most obvious objection to reincarnation is that there is no evidence of a physical process by which a personality could survive death and travel to another body. This same objection would apply to all beliefs in survival after death. Some skeptics explain that claims of evidence for reincarnation originate from selective thinking and the psychological phenomena of false memories that often result from one's own belief system and basic fears, and thus cannot be counted as empirical evidence. Spiritualists believe in the soul's survival after death, after which they take on a new existence in the afterlife. Many are mediums or channels for spirits on the other side. They are divided in their views on reincarnation. Those with theosophical leanings or who follow in the footsteps of Edgar Cayce are proponents of reincarnation. Critics reply that apparent reincarnation is really possession or influence by other spirits. Edith Fiore, author of The Unquiet Dead, has worked with children and adults who have spirits attached to them or possessing them; they can create apparent memories and feelings in the person possessed that can be interpreted by believers in reincarnation as recollections of past lives. The possessing spirit tries to live through its host, yet the result is to damage the host person's identity. Cultures where belief in reincarnation is widespread can create an unhealthy spiritual burden on the living, as departed spirits believe they should attach themselves to newborns. Scripture promises eternal life to those who believe (John 3:16). If a believer who had assurance of eternal life were reincarnated into a body of a non-believer, his eternal life would be falsified. Jesus died once and for all, to save sinners. Therefore salvation in Jesus Christ is good for eternity. Being once and for all, it is a better hope than reincarnation. For believers scripture offers the hope of the resurrection—an eternal future in a glorified, spiritual body (1 Corinthians 15:44). Reincarnation would vitiate that hope. If a believer who had assurance of the resurrection were reincarnated into a body of a non-believer who died in sin, then his former assurance would be falsified. If a believer were reincarnated after the resurrection, it would mean that the resurrection was not eternal. God created Adam from the dust and breathed into him of his spirit (Genesis 2:7). Likewise, every person is a unique creation of God. A person who arrives on earth as the result of previous lives is not God's unique creation. Thus the doctrine of reincarnation makes it difficult for people to relate to God as their creator. God created each person to have a relationship of love with him, uniquely and eternally. God exists eternally. To be fully loved by God requires awareness of one's identity, one's deeds and one's qualities, which likewise exist eternally. Reincarnation allows for no such enduring awareness on the part of the individual, even though God would know him well through many lifetimes. This would create a large gap between fully-aware God and ignorant humans. It would thus frustrate the purpose for which we were created. God created human beings to love one another, and instituted the family so we could grow in our love for spouses, siblings, parents and children. According to Emanuel Swedenborg, conjugal love continues to exist in afterlife. Reincarnation, although it can create some kind of solidarity of all humans, nevertheless still views each individual as ultimately alone, forming families which will dissolve, leaving no memory behind. For Christianity, God is love, and his works are about the fulfillment of love. In this light, the doctrine of reincarnation falls short of the ideal of love. The Bible teaches the absolute distinction between humans and animals; only the former are created with God's spirit. Furthermore, God creates every being uniquely "according to its kind," that the soul of each being may manifest that being's outward form. Hence a human soul cannot be reincarnated into a dog, or vice-versa; they are different in kind. Being aware of this drawback of Christianity, theologian John Hick has explored an alternative way of re-embodiment which still rejects reincarnation but which gives a second chance for salvation or liberation after death. For this purpose, Hick has given a new meaning to the Christian notion of bodily resurrection. Although conventional Christianity denies that resurrection can bring salvation to the wicked once they die, Hick's new conception of resurrection brings forth the spiritual growth of an imperfect and even wicked person after death. In his view, the environment of an objective community of resurrected, re-embodied persons in the other world "generates the moral pressures by which we may grow as persons." Generally, Jews who object to reincarnation would raise many of the above Christian arguments. In addition, a thoroughgoing doctrine reincarnation would run counter to the Jewish sense of uniqueness as a chosen people, as Jews would sometimes reborn as a Gentiles and Gentiles as Jews. The Jewish doctrine of gilgul, although comparable to reincarnation, is actually not. The living person retains his own personality and individuality even as he represents the transmigrated soul of his forbearer. All accounts of gilgul are about the transmigration of old Jewish souls into other Jews. Reincarnation is subject of "Thursday's Fictions," a cross media work which has transmigrated across the delivery platforms of stage spectacle (1995), book (1999), film (2006), 3D online immersive story word in Second Life (2007), and machinima series (2007). ↑ See Śvetāśvatara Upanishad 5.11 and Kauśītāki Upanishad 1.2. ↑ "Reincarnation: Socrates to Salinger."harekrishna.com. Retrieved September 13, 2008. ↑ Much of this is documented in R.E. Slater. Paradise Reconsidered: 9/11 and 7/7, Reincarnation, and the Lost Gospel of Jesus. (Crest Publishing, 2006). ↑ "Śvetāśvatara Upanishad" 5.11-12, in Robert Ernest Hume, ed., Thirteen Principal Upanishads. (London: Oxford University, 1921), 407. online googlebooks. Retrieved September 13, 2008. ↑ Robin Rinehart. Contemporary Hinduism: Ritual, Culture, and Practice. (ABC-CLIO, 2004), 19-21. ↑ Karel Werner. A Popular Dictionary of Hinduism. (Curzon Press, 1994), 110. ↑ SikhiWiki, encyclomedia of the Sikhs. online "Reincarnation." Retrieved September 13, 2008. ↑ "Transmigration and Rebirth," Milindapañha. accesstoinsight.org.Retrieved September 13, 2008. ↑ Kusala Bhishu, "The Five Precepts."urbandharma.org. Retrieved September 14, 2008. ↑ "Chuang Tzu," chap. 24. Retrieved June 17, 2008. ↑ Flavius Josephus. The War of the Jews. Book II, Chapter 8, Verse 14. ↑ J.J. Dewey,"Reincarnation and the Bible." Retrieved June 17, 2008. ↑ Geddes MacGregor. Reincarnation in Christianity: A New Vision of Rebirth in Christian Thought. (Theosophical Pub House, 1978). ↑ Questions and Answers from The Noble Koran, "What does Islam think about reincarnation?"answering-christianity.com. Retrieved September 13, 2008. ↑ Raynold A. Nicholson. The Mystics of Islam. (London: Routledge, 1914), 168. ↑ Hazrat Inayat Khan. The Sufi Message, vol. V. (Motilal Banarsidass, 1995), part 3. ↑ William Butler Yeats. A Vision. (New York: Collier Books, 1966). ↑ "Theosophy—Modern Presentations: Reincarnation."blavatskytrust.org.uk. Retrieved September 14, 2008. ↑ "Does Scientology believe in reincarnation or past lives?"scientology.org. Retrieved September 14, 2008. ↑ Ken Ring, "Reincarnation and NDE Research."neardeath.com. Retrieved September 14, 2008. ↑ Richard Rockley, "Book Review: Children who Remember Previous Lives by Ian Stevenson." skepticreport.com. Retrieved June 18, 2008. ↑ Tom Shroder, "Ian Stevenson; Sought To Document Memories Of Past Lives in Children," Washington Post, 11 February, 2007, sec. C. washingtonpost.com. Retrieved June 18, 2008. ↑ Remi J. Cadoret, review of European Cases of the Reincarnation Type, by Ian Stevenson, The American Journal of Psychiatry 162 (2005): 823-824. . American Journal of Psychiatry. Retrieved June 18, 2008. ↑ Jim Tucker. Life Before Life: A Scientific Investigation of Children's Memories of Previous Lives. (St. Martin's Press, 2005), 214. ↑ University of Virginia, Division of Perceptual Studies, "Books and Articles by Division Staff." Retrieved June 18, 2008. ↑ Tom Shroder, "Ian Stevenson; Sought To Document Memories Of Past Lives in Children," Washington Post, 11 February, 2007, sec. C. . Retrieved June 18, 2008. ↑ Edith Fiore. The Unquiet Dead: A Psychologist Treats Spirit Possession. (Ballantine Books, 1995). ↑ John Hick, "Life after Death," in The Westminster Dictionary of Christian Theology, ed. Alan Richardson and John Bowden. (Philadelphia: Westminster Press, 1983), 331-334. Hubbard, L. Ron. Have You Lived Before This Life? : A Scientific Survey. A Study of Past Lives through Dianetic Engrams. Vantage Press. 1960. Steiner, Rudolf. Karmic Relationships: Esoteric Studies. 8 vols. Steiner, Rudolf. Manifestations of Karma. Rabbi Nissan Dovid Dubov. "Reincarnation: A Jewish Belief" (audio file). Carol Bowman. "Families Reincarnating Together." University of Virginia. "Division of Perceptual Studies." HareKrishna.com. "Reincarnation: Socrates to Salinger." Melinda Wenner. "Belief in Reincarnation Tied To Memory Errors." This page was last modified on 8 July 2015, at 21:43.